New Delhi: The central government procured a record Rs29,070 crore worth of pulses and oilseeds from farmers at minimum support prices (MSPs) in the 2017-18 crop season, arresting what could have been a sharper fall in wholesale prices. The procurement was unprecedented and triggered by growing unrest among farmers spread across the country. Given that this constituency is politically critical, especially due to the busy election season—six states have gone to polls in the past eight months and four more follow in 2018—and general elections due in less than a year, the Union government turned out the stops. “Procurement of pulses in the last three years is more than five times what government agencies purchased in the previous 15 years," said Sanjeev Chadha, managing director of National Agricultural Cooperative Marketing Federation of India Ltd (Nafed), adding, “The achievement is due to the centre’s commitment to procure from farmers at support prices and monitoring on a daily basis by the Prime Minister’s Office." 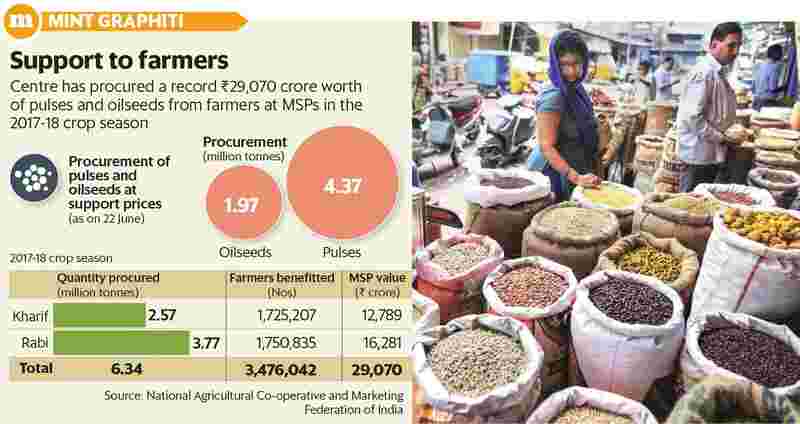 According to Nafed, the central agency assigned to procure directly from farmers at government-set MSP, 6.34 million tonnes of pulses and oilseeds were purchased from close to 3.5 million farmers till 22 June. In India pulses and oilseeds are mostly grown by resource-poor farmers in rain-fed areas. While the agency purchased about 4.4 million tonnes of pulses grown by farmers in 2017-18 (about 18% of the estimated 24.5 million tonnes produced), procurement of oilseeds at support prices were at 1.97 million tonnes or 6.4% of the estimated production. At support prices, the value of pulses procured by Nafed is a staggering Rs20,768 crore. Chadha said that while government agencies procured about Rs12,000 crore of pulses and oilseeds in 2016-17, procurement of these crops had never crossed Rs3,000 crore. In 2017-18, prices of most crops including pulses and oilseeds fell below government announced support prices following a record harvest. Part of the reason for the plunge in prices to levels significantly lower than MSP is the missing trader—the key price maker in the market. “As the government is procuring heavily, traders are finding it more convenient to purchase from Nafed instead of farmers... makes business sense for them as they are saving on transport and storage costs," Chadha said. Disaggregated data from Nafed shows that the government agency purchased 2.6 million tonnes of chana (gram) following the winter harvest this year, over 23% of the estimated production of 11.2 million tonnes. Yet, wholesale prices were around Rs3,500 per quintal in end May, lower than the announced MSP of Rs4,400 per quintal. “The question now is how the government plans to dispose of these stocks and at how much losses," said Siraj Hussain, former agriculture secretary and visiting senior fellow at Indian Council for Research on International Economic Relations, Delhi. The fact that pulse prices are lower than MSP despite record procurement could be due to lower consumption demand or lack of trader interest, Hussain adds.